CD-9’s Lt. Col. Wendy Rogers: Game On! Tempe, AZ – Last week, Lt. Col. (ret) Wendy Rogers’ campaign for Arizona’s new 9th Congressional District filed 993 signatures to secure her spot on the ballot, becoming the first Republican candidate to do so. For more information about Wendy Rogers, visit her website at www.WendyRogers.org. Just six years ago, Arizonans enacted one of the nation’s strongest protections for property rights. That measure is Proposition 207, and it says the government must compensate you when regulations reduce your property value. Christina Sandefur is an attorney with the Goldwater Institute. GLENDALE, Ariz. –Walt Opaska, candidate for Glendale mayor, filed more than the 934 signatures required to get his name on the ballot. Opaska filed 1266 qualified signatures of Glendale voters. Opaska’s impressive filing shows that residents are ready for a mayor who puts Glendale first. Walt Opaska is the son of a teacher and a small businessman. A graduate of the University of Arizona’s James E. Rogers College of Law, Opaska works for Bryan Cave LLP where he specializes in intellectual property rights. Opaska is a long-time leader in the Arizona conservative movement. He serves on the executive board of Arizona Right to Life, and he cofounded the Arizona Republican Attorney Association with Phoenix Councilman Bill Gates. He has been active in the fight to lower taxes and end corporate welfare. In 2007, Opaska chaired the No New Sales Tax for Glendale campaign, a grassroots effort opposing Glendale’s ballot initiative to raise the city’s sales tax. In addition to professional and political involvement, he has been actively involved in numerous charitable groups, including the 20-30 Club and the Cystic Fibrosis Foundation. Opaska is married and has a four-year old daughter. To learn more about Walt Opaska and his campaign to be the next mayor of Glendale, please visit www.opaskaformayor.com. PHOENIX, AZ – Maricopa County Sheriff Joe Arpaio filed his nomination petition signatures to run for a sixth term as Sheriff. The Sheriff submitted over 15,000 signatures from Republican and Independent voters throughout Maricopa County. This figure is more than four times the requisite number to qualify for the ballot. “So many people I’ve never met went out and collected signatures for me all on their own. I know it’s a lot of hard work and I’m grateful for their support,” stated Arpaio. Washington, D.C. – Republican Congressman Jeff Flake, who represents Arizona’s Sixth District, today praised the passage of H.R. 1299, the Secure Border Act, introduced by Congresswoman Candice Miller of Michigan. The bill directs the Secretary of the Department of Homeland Security (DHS) to create for congressional approval a strategy for gaining operational control of the northern and southern U.S. borders. “Given that the Obama Administration has given up reporting the level of operational control on the border, it’s no wonder Congress has to force them to come up with an approved plan to achieve it,” said Flake. In 2011, Congressman Flake introduced in the House H.R. 1507, the Border Security Enforcement Act of 2011, which is focused on achieving operational control of the southern U.S. border by increasing border resources. Senators John McCain and Jon Kyl introduced the legislation in the Senate. Among the 10 key provisions of the bill is the deployment of up to 6,000 National Guard troops and 5,000 additional Border Patrol agents to the United States-Mexico border by 2016. It would create additional Border Patrol stations along the southwest border and six additional permanent Border Patrol Forward Operating Bases and would upgrade existing bases. Arizonans have the right to bear arms nearly everywhere in this state without having to register anyone or anything with the government. Likewise, as mighty as the pen might be, no one should be forced to register themselves (or their pen) before communicating with elected officials about legislative reform. Yet, Arizona has done just that through its overreaching lobbying laws. Arizona does not define “lobbying” as lurking in the lobbies of the legislature and trading an expensive steak dinner for an opportunity to bend a legislator’s ear. Instead, Arizona law defines lobbying as “attempting to influence the passage or defeat of any legislation by directly communicating with any legislator.” Even a newspaper columnist who directly emails a link to his latest opinion editorial to a legislator is lobbying if the email dares to express an opinion on a pending or proposed bill or legislative reform. Although vaguely worded exemptions appear to limit the reach of Arizona’s lobbying regulations, the reality is that no one can freely talk to elected officials in Arizona about legislative reform without being threatened by the government. Even if citizens and citizen groups invoke exemptions to avoid the need to register as lobbyists, as the Goldwater Institute has for its analysts, elected officials will still try to silence or impede public testimony as supposedly impermissible lobbying. This is because Arizona’s complex and lengthy lobbying laws encourage elected officials to believe citizens and citizen groups lack legal authority to speak freely on public policy. In effect, citizens are now presumed to have no inherent right to communicate with their representatives. This is an incredibly dangerous development. In a free society, no politician should think even for a moment that he can require citizens and public interest groups to get the government’s permission to talk to the government. Unfortunately, Arizona’s lobbying laws threaten this foundational requirement of our representative republic. For that reason, it is time to reform Arizona’s lobbying laws to more fully protect our First Amendment rights, just as we have reformed Arizona’s gun laws to more robustly protect our Second Amendment rights. Our first freedom should get at least as much respect as our second. A longer version of this article originally appeared in the Arizona Capitol Times. Nick Dranias is the Director of Policy Development and Constitutional Government at the Goldwater Institute. Phoenix, AZ – Today, Vernon Parker filed over 1,143 signatures with the Arizona Secretary of State’s office to qualify as a Republican candidate for the newly created Congressional District 9. (Scottsdale, Arizona) Scottsdale Mayor Jim Lane’s re-election campaign has submitted 1,625 signatures in order to get on the August 28th Primary ballot. The signatures were handed in Tuesday afternoon to the City Clerk. The signatures were gathered entirely by volunteers. No paid petition collectors were used. That’s because there are so many supporters who know that Scottsdale is headed in the right direction. Clearly, Scottsdale is better off than it was four years ago. Now is not the time to lose that momentum. Unemployment in Scottsdale is down one percent compared to a year ago and the City enjoys one of the lowest unemployment rates in the Valley at 5.9%. The unemployment rate for Maricopa County is 7.4%. A recent article in the Arizona Republic noted the decrease in unemployment as well as the economic strides Scottsdale has made. To read the article click here. “Our economic engine is running again thanks to smart growth and important reforms. I hope to finish what we started and ensure that Scottsdale remains the best city in America,” said Lane. 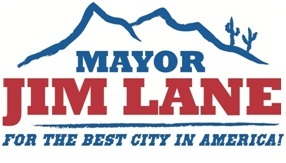 Mayor Lane has kept his promises. Under his leadership, Scottsdale’s economy has expanded and attracted new investment, while the city continues to be a leader in the arts and setting aside lands for preservation. A copy of Mayor Lane’s 7 minute video can be viewed here. The campaign has also launched Facebook and Twitter pages. For more information please contact Mike Manson. Maricopa County – Today, the Steve Chucri campaign officially filed its nominating petitions with the Maricopa County Elections Department in order to qualify for the Maricopa County Board of Supervisors District 2 election. In total, the campaign collected over 3,500 signatures. The campaign far surpassed the required number of 981 signatures, showing the immense support that Chucri has generated across District 2. “I’m very pleased with the momentum my campaign has been methodically building in preparation of reaching victory on Election Day,” stated Chucri. 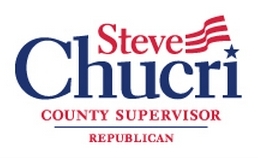 Endorsements for Steve Chucri include U. S. Senator Jon Kyl, Congressman Jeff Flake, Congressman Ben Quayle, Congressman David Schweikert, Congressman Paul Gosar, Congressman Trent Franks, State Senate President Steve Pierce, Maricopa County Supervisor Andy Kunasek, Gilbert Mayor John Lewis, Mesa Mayor Scott Smith, Scottsdale Mayor Jim Lane, Chandler Mayor Jay Tibshraeny, and Paradise Valley Mayor Scott LeMarr. Chucri has served as the President & CEO of the Arizona Restaurant Association (ARA) since 2002. Under his leadership and tireless work ethic, the ARA and restaurant industry has enjoyed a substantial growth in sales in what will amount to a ten billion dollar industry in Arizona this year alone.